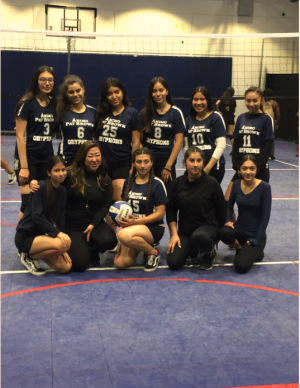 APB’s girls volleyball team had their first game of the 2018-2019 semester on Monday, the 29 of October. The volleyball team was able to win their first game against Alliance Tech High school. When interviewing senior, Jocelyn Carranza about how she felt before the game she said, “I feel nervous because we have a new team this year, new girls and we’re currently getting used to playing with each other.” With a new addition to the girls team, the girls were able to achieve the win working together. When interviewing junior Valeri Rios how she feels about the new teammates she said, “I feel they’re getting it, but I feel they’re gonna panic during a game because of the audience and pressure there is.” To win a volleyball game, a team has to win 3 games, the volleyball team won 3 out of the 4 games they played. This is pretty good, taking in fact that it was some people’s first volleyball game ever. This is not APBs first game against Alliance Tech high school. APB has played this school 3 times in the past years. APB has won 2 out of the 3 games resulting in the record being 2-1. When interviewing sophomore, Rut Jimenez, about whether Alliance was a challenging team she said, “I’d say that we may have missed many of our serves which gave them most of the points, but I don’t think it was much of a challenge because they weren’t as prepared as we were and they don’t have the skills that we do.” Rut felt confident when she set foot onto the court, believing that the team was going to earn this win.